The Gender Equality Mela of Miranda House 2018 was celebrated with a great degree of success with on 4th and 5th of April. Day one started with an interactive session by renowned feminists and social workers Kamla Bhasin and Suneeta Dhar who discussed various meanings and strands of the larger women’s movement. On their insistence, the students engaged in a highly stimulating session on their everyday stories of resistance. In the second session of the day, Bijaylakshmi Nanda, Associate Professor of the Department of Political Science at Miranda House, Divya Vaishnava, a social worker and founder of BUD Foundation, and Preeti Choudhury, author and lecturer, talked about various ways in which the culture of accountability can be remoulded in the context of sexual harassment and the issue of consent. It was followed by a round of Q&A with the audience that led to heated debates between the panelists and the students. The speakers attending the third session were journalists Rakhee Bakshee and Richa Aniruddh who talked about the stigma surrounding female journalists and their work in the media in a session titled “What’s on Screen? Gender and Media”. Both of them highlighted the various biases they have had to confront during the years in their career ranging from adhering to a perfect body to ignoring sexist comments while pursuing a story. They concluded, after a vigorous Q&A session, that although there have been changes in the media now, women who are going to pursue this career still have a long journey to endure. The day ended with a roundtable session between the representatives of Internal Complaints Committee from various colleges such as Kirori Mal College, Hindu College, St. Stephen’s, Ramjas, Shri Guru Tegh Bahadur Khalsa College, and Miranda House, talking about the institutionalised sexual violence in the University space. The session was moderated by Titiksha Vashisth, a Masters student from JNU and a Miranda House alumnus. The students discussed the structural problems regarding the functioning of the ICC such as an unhelpful administration while recognising that there is a need for the larger issue which is battling patriarchy and talking about sexual harassment. The second day saw a series of interesting panel discussions again. The first event was an interactive session on the stories of acid attack survivors. Acid attack survivors Chandrahas Mishra and Ms. Geeta shared their stories of survival and dealing with the stigma that came with the horrific incidents that occurred with them. Mr. Mishra, a member of Acid Survivors Foundation India (ASFI) and an activist, pointed out the difficulties that survivors face in getting treatment, overcoming their mental and physical trauma and seeking support from the government. Ms. Geeta also shared her story of courage and resilience and how ASFI helped her recover from her incident. The second session was on ‘Women in Conflict Areas’. 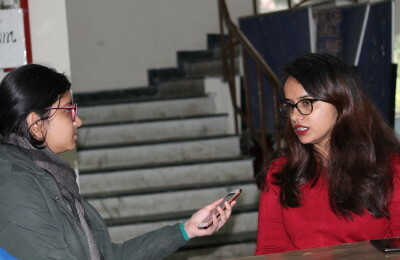 Rita Manchanda, a well-known journalist and research scholar, Mehroosh, a student of psychology of law at Jamia Milia Islamia and Samreen Mushtaq, a doctoral candidate at the Department of Political Science at Jamia Milia Islamia, were the speakers for the panel. In an intense, emotional session the speakers talked about the various shades of problems and identities that women grapple with in conflict-ridden areas with special reference to the Kashmir dispute. The third session was on ‘Masculinity and Consent’ which was on various facets of the gender roles attributed to men and how consent plays a role in our everyday lives. The panel consisted of Suraj Pawar, social activist and program coordinator of Azad Foundation, Pavel Sagolsem, research scholar and program associate at Centre for Health and Social Justice and Dhruv Pandey, Assistant Professor at the Women’s Studies and Development Centre, University of Delhi. The last panel discussion of the day was on the challenges faced by the LGBTQIA+ community, the speakers being Aroh Akunth, a Dalit and queer activist and member of the Queer Collective at Ambedkar University, Ritambbara Mehta, the co-founder of Nazariya and Rudrani Chhetri, a well-known transgender activist from Delhi. Kabir Trivedi, the founder, and president of the Miranda House Queer Collective moderated the session. The discussion veered towards the queer and Dalit politics in India especially the issues of identity, harassment, and marginalisation these communities face. The two-day festival ended with a screening of Anurag Kashyap’s That Day after Everyday, an award-winning film on the problems faced by women every day in public spaces. The Gender Mela was deemed to be a success by all the members of the Miranda House Women’s Development Cell as well as the audience present.